^Donald Wiseman brings to this portion of Scripture his life-long study of the archaeology, history, languages and documents of the Ancient Near East. No other commentary on Kings offers as much historical background and well-considered judgment in such concise and accessible form. 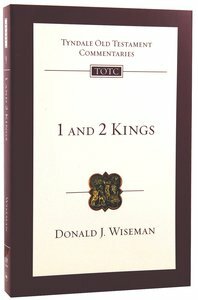 About "1&2 Kings (Re-Formatted) (Tyndale Old Testament Commentary Re-issued/revised Series)"
Donald J. Wiseman (Ph.D., University of London) is emeritus professor of Assyriology at the University of London in England. He worked on excavations in Iraq and Turkey with Sir Max Mallowan and Sir Leonard Woolley. He has published many Akkadian texts and written numerous scholarly and general books on the ancient Near East. After working as Keeper of Western Asiatic Antiquities, the British Museum he became Professor of Assyriology at the University of London in 1962, a position he held until his retirement. Professor Wiseman has many honours including an O.B.E.. He is a fellow of the British Academy and he was awarded a D. Litt. His publications include 1 & 2 Kings (Tyndale Old Testament Commentary), New Bible Atlas, Nebuchadrezzar and Babylon, Peoples of Old Testament Times and Persia and the Bible.